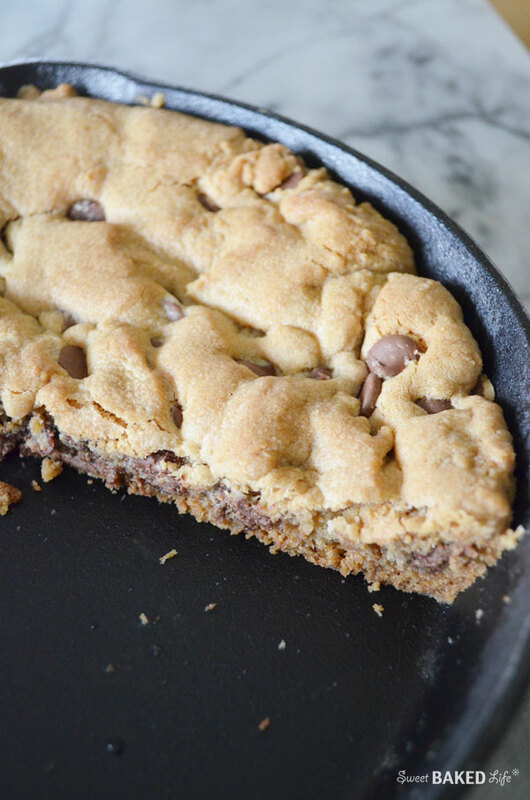 Nothing says love and comfort more than a big, warm Skillet Chocolate Chip Cookie. And since I’ve been wanting to share this simply great recipe with you for a while, now seems to be that perfect time. Because if you’re reeling from the effects of the nasty cold and flu season like my family has been, then I’m prescribing this sweet and satisfying cookie that will make even your gloomiest, sickest days a little better. You see, my 13-year old son has been sick since mid-December, just before he started his 3-week winter break. So during his entire vacation through Christmas and New Years he has been fighting some type of sickness. No fun for sure! First it started with the cold/flu symptoms, then it progressed and got worse with a nasty cough that kept him (and me and the hubby) up all night, and now this fast-traveling bug has moved into his ear and sinuses. Needless to say, he has been moping around for about 4-weeks with aches, pains, non-stop coughing, not being able to sleep or breathe, and pretty much feeling miserable from head to toe. After several trips to the doctor; diagnosed with Bronchitis last week and then yesterday diagnosed with an ear infection and a sinus infection, 2 different antibiotics, strong cough medicine, plenty of rest, gallons of fluids, humidifier running all night, and lots of love and attention from his mom and dad, he is hopefully on the mend! Phew! Can you believe this crappy, ever-changing virus has invaded my son for so long? As a matter of fact he feels “cheated” that he did not have a proper vacation. Poor kid. And school? Well, that started yesterday without him. Hopefully the new meds kick-in quickly so he can get back in his class on Friday, or Monday at the latest. The strangest thing about this illness, and luckily I might add, is that my husband and I never got sick. Now that’s weird. 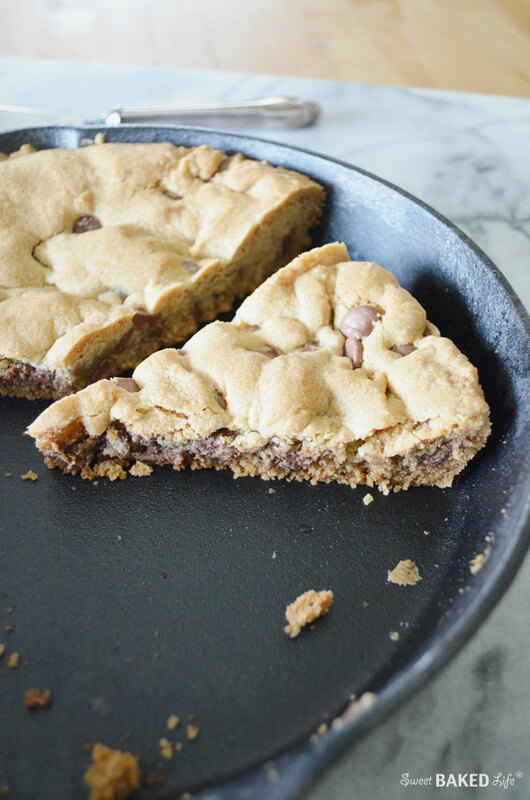 So, if you’re taking care of sick ones, or if you just need a little sweet something to cheer you up, you have got to try this Skillet Chocolate Chip Cookie. 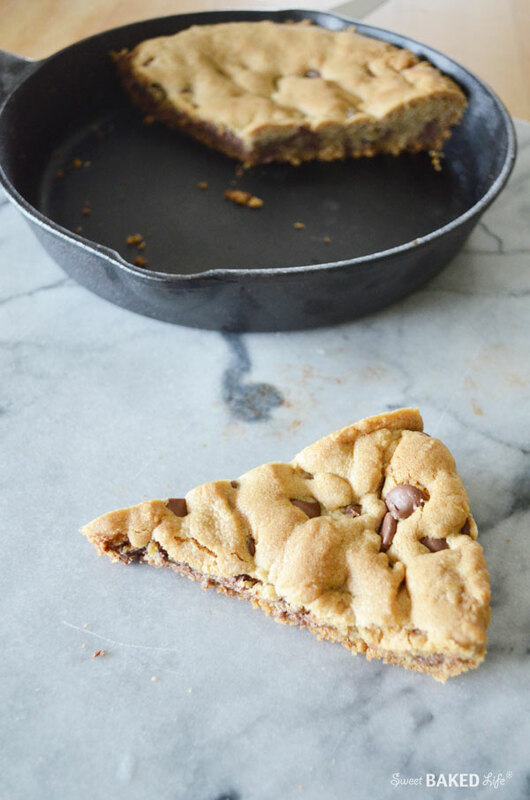 You see, I have always wanted to make one of these giant cookie pies, and with the addition of my new cast-iron skillet I was finally able to bake one of these delectable treats for my kid just before this dreaded sickness was full-blown! The best news is, it is super easy to make! Now my family loves traditional chocolate chip cookies. Me on the other hand, well, even though I love cookies, I would rather bake some type of bar cookie. I just don’t have the time these days to make sheet after sheet of perfectly crisp cookies. This batter comes together quickly and bakes up to a golden perfection. You start by making a traditional cookie recipe then just pat it firmly into your pan and stick it in the oven. My kind of recipe for sure. The outcome is an incredibly soft, rich buttery cookie base dotted with melted, sweet milky chocolate. It’s so good that it will quickly disappear from your pan – at least that’s what happened in my house! A big slice of this delectable cookie will put your loved one on the road to recovery and from my prescription pad, is the perfect remedy for feeling better. Whisk together the flour, baking soda, and salt in a medium bowl and set aside. In a large bowl of an electric mixer using the paddle attachment, add the butter and sugars and beat until mixture is fluffy, approximately 2 minutes. Then add the egg and vanilla and mix until completely blended. Slowly add the four mixture and blend until just combined. Scoop dough into a 9-inch cast-iron skillet and press with your hands to flatten. Bake until cookie is golden brown, about 35-45 minutes. Be sure not to over-bake or it will harden. Cool for about 5 minutes before cutting into wedges. 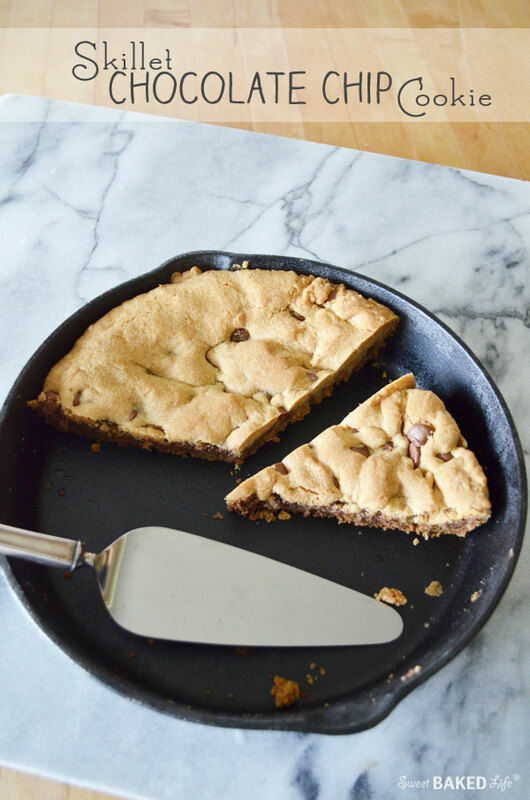 If your family is in need of some TLC this cold and flu season; heat your oven, whip together this Skillet Chocolate Chip Cookie, and indulge in this homemade goodie! And I may just have to make another one myself to give my son the sweet boost he needs! I love skillet cookie. I never made it myself though. Must give this a try. Goodness, that is way too long for anyone to feel so sick! I am so sorry for your son, I hope he feels better really soon! What a nice mom you are to make this wonderful treat for him though. It looks like pure comfort!